Soccer(VSF5000) - Yuan Chi Sports Enterprise Co., Ltd. The untimate in synthetic polyurethane (PU) ball in black + white color. Consistently designed with VEGA's unique molding and deep channeling system. Durable nylon machine wound assures true balance and ideal shape. 32 white / black panels with VEGA unique deep channeling system (for 18 panels, also avilable in size 5 PVC and rubber balls). Completely waterproof and scuff proof. Very good durability and playability. 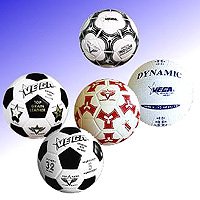 Also we provide PU and PVC both FIFA low bounce and no bounce specs indoor soccer. Commitment in performance, product design, and market value. Capacity to manufacture performance & quality meeting FIFA standards. Minimum Order: $6,000 per shipment. Below that, a handling fee, $200 will be charged.